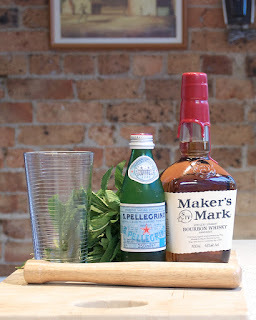 Whilst living in the United States for eighteen months, I discovered the Mint Julep. Seeing it is the first Saturday in May, it seems only fitting we talk about this traditional Kentucky Derby day drink. The mint julep is a cocktail which contains a muddled and heavily iced mixture of bourbon, mint, sugar and water. It is a 'tea-style' cocktail, somewhat similar to a mojito in its construction. 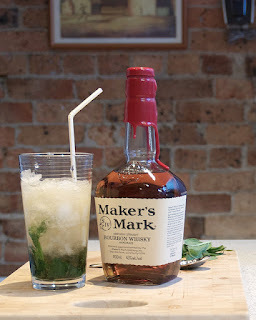 For those who live in northern states of Australia, I find the mint julep is perfect for the hot and humid conditions. My craving usually starts once the mercury starts rising and believe me, it is a craving. My first experience with the mint julep occurred whilst on a trip to Washington DC, where in the Round Robin & Scotch Bar of the Willard Hotel you'll find the bar tender, Jim Hewes, making the best mint julep in DC (see below). I loved it so much we frequented this bar multiple times during trips to Washington DC from our temporary home in Summit, NJ. The Willard Hotel is one of DC's more famous hotels and is traditionally where the Australian Prime Minister stays when visiting the US capital. Australian flags adorn masts outside the hotel when they are visiting, as we discovered on one of our trips. If you are ever in town, make the trip and be sure to try the The Willard Hotel's signature drink.